Reliable communication is critical for an airport to be able to function on a daily basis. Airport communications face challenges with aging infrastructure, changing technology needs, and a mash-up of incompatible systems. Airport communication systems need to be dependable, have failover support, be easy to use, and provide scalability to accommodate future demands. With all of that in mind, Qingdao Liuting International Airport looked to Yeastar to update and reduce the costs of their communication system. Qingdao Liuting Airport is located in the city of Qingdao, Shandong Province, China. It annually serves 12 million passengers and 200,000 tons of goods, cargo, and freight. In a peak hour, Qingdao Liuting Airport can handle over 5,000 passengers arriving and departing on 14 boarding bridges, 44 gates, 82 domestic airlines, and 12 international airlines. In other words, it’s a big airport with a lot of traffic. Airports have a high volume of goods, baggage, and passengers so their communication requirements can be more demanding than a typical business, warehouse, or other service or hospitality application. 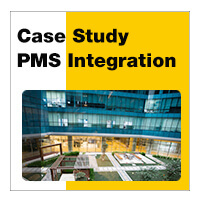 More Users: They wanted to add more users without changing their existing IP-PBX. New Extensions: They wanted all new extensions to automatically be able to use direct dialing with extension numbers. Broadcast Announcements: Boarding gate staff needs ability to use the phone to broadcast announcements to passengers. Intra-Airport Communication: Aiport departments needed a faster, smoother internal communication system to relay information. Stable and Reliable: The internal communication system will be operating 24/7 so, they needed as stable system with as little downtime and failure rate as possible. No Maintenance: The system needed to be simple for anyone to use. 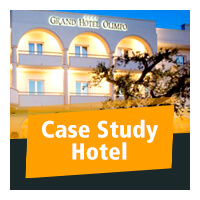 Easy management, no maintenance, and no special expertise required. For many PBX manufacturers that would be a tough list of requirements to satisfy. Yeastar was able to meet their special needs with two PBXs from the MyPBX U5 Series. Yeastar deployed two MyPBX U500 IP-PBXs to the existing IP-PBX at the Qingdao Liuting Airport that was powering their broadcast system. The Yeastar MyPBX U500 is a standalone hybrid IP-PBX that excels in its flexible compatibility with PSTN/ISDN BRI lines plus GSM/UMTS networks and IP lines, giving users the benefit of the latest VoIP technology plus the reliability of traditional phone networks. The scalability of the U500 is a major benefit that businesses take advantage of. It has modular technology that enables the company to choose the combination of FXO, FXS, BRI, GSM, and UMTS modules that they need. Additionally the U500 is interoperable with leading VoIP phone manufacturers such as Yealink, Snom, Grandstream, Aastra, Polycom and Cisco. 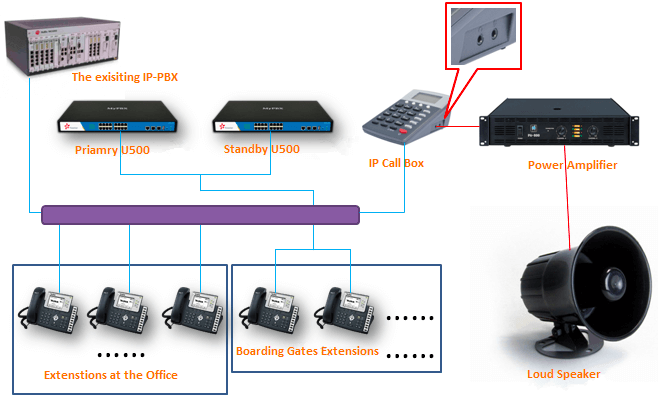 When Qingdao Liuting Airport said that they needed to add more users without changing their existing IP-PBX, the MyPBX U500 was the obvious choice. To upgrade the Quingdao Liuting Airport communication system, we needed to deploy two MyPBX U500s. One U500 acted as the primary server while the other PBX was used as the standby server. The U500 was then connected to the airport’s existing IP-PBX through peer-to-peer mode. With a Yeastar PBX solution, Qingdao Liuting Airport gained a communication system that they could rely on, has flexible features, and is easy to use and maintain. If the primary server goes down, the backup U500 PBX takes over and the admin gets notified via email and SMS text message. Compatible with other IP-PBX systems and traditional PBXs including other management systems such as ERP, OA, CRM, and dispatching systems. The U500 PBX does not require complicated cabling and can be easily configured and managed online through a web interface. Internal communications are accessible with a network port or Wi-Fi. Terminals like IP phones, mobile softphones, and PC softphones can also all access the system. With the intuitive and user friendly GUI, anyone can perform daily management and maintenance duties. The U500 comes with conferencing, video calling, call recording, and intercom functionalities that boost productivity and increase efficiency. Join the Yeastar Partner Program today to deploy powerful Yeastar PBX solutions for your customers.